nothing brings people together more than community-oriented events and activities. here's what's happening this march in Sb. This fundraising event supports the Garden’s core programs in environmental education, conservation and research, and native plant horticulture. Join for an afternoon of music, food, and one-of-a-kind beers throughout our historic gardens. Ticket purchases help support the Santa Barbara community in this time of need. After the Thomas Fire and mudslides that affected Santa Barbara and Ventura counties, free admission was offered to all visitors for more than a week. Beginning in April 2018, the Garden will offer First Responder Sundays, where we will offer free admission to first responders of the Thomas Fire and mudslides the first Sunday of each month. Don't miss out on the March-end of Santa Barbara's very own Restaurant Week! Delicious and affordable 3-course meals are available at the most desirable Santa Barbara eateries. You won't want to pass this up! SB Restaurant Week has partnered with the California Restaurant Association Foundation. SBRW will be giving 50% of our proceeds from restaurant registration to CRAF's grant program, Restaurants Care that offers financial relief for restaurant/hospitality workers who experienced losses during the Thomas Fire and Mudslide. We hope to see you at these wonderful events! If you can't make it, don't worry. There are plenty of ways for you to help keep our community strong. View our ongoing #montecitostrong blog for additional information regarding ways to both give back and to receive help if you are in need. Single day and weekend passes available now! 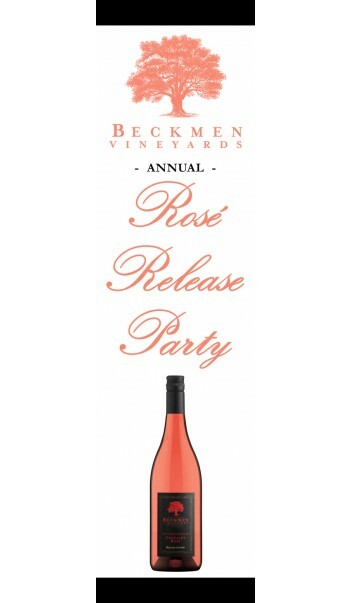 Be the first to enjoy our delicious Grenache Rosé alongside our other popular white and red wines. Hollywood's famous Pink's Hot Dogs will be serving an array of their delicious hot dogs with live music provided by The Richard Diaz Band. Soak up the beautiful views of our estate vineyard and enjoy our favorite party of the year! Puppets are taking over Santa Barbara! The Santa Barbara International PuppetPalooza consists of four days of family-fun events, performances, and celebrations throughout the city. Register now! Come enjoy five days of unique documentaries, dramas, comedies, and shorts you won’t see anywhere else. The Santa Barbara Jewish Film Festival celebrates the diversity of Jewish history, culture, and identity while hoping that the films and their stories will resonate beyond these settings and speak to universal experiences and issues that confront our common humanity. $80 Early Bird price for all-access passes. Thousands of blooms in every imaginable shape, color, pattern and texture, will be showcased at the show, one of the country’s largest and oldest celebrations of orchids. The 73rd annual Santa Barbara International Orchid Show pays homage to a family of flowering plants that boast 25,000 species, among which beauty is ubiquitous and uniqueness is commonplace. GA: $14 – senior, student, and kids rates apply. There’s no better time than the season when clocks “spring forward” to honor the world’s many and varied frogs and amphibians. Meet Snow White, Sleeping Beauty, Rapunzel, and other princesses in person as they help celebrate frogs. There are also frog-inspired crafts, games, and special animal appearances. All costumed princesses welcome – as are knights, pirates, and cowboys. Learn how zoos and aquariums are working to save the world’s threatened amphibians.